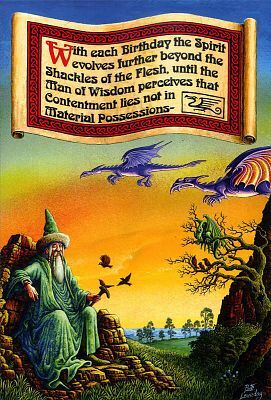 - Front of card reads: With each Birthday the Spirit evolves further beyond the Shackles of the Flesh, until the Man of Wisdom perceives that Contentment lies not in Material Possessions--... , and continues on the inside: ... so I didn't bother to buy you a present. Have a Contented Birthday! Artwork by Pete Loveday. Tree friendly, printed with vegetable oil based ink. Card measures 8" by 5 1/2". Do you have any other questions about our Contented Birthday Card? I bought this card for my best friend's birthday. The artwork is beautiful and the message is simple, but fun. I am sure this will be added to his keepsake drawer, which makes it worth the price!